COBOL research, what do we do and why? The research group "IT-Management and Software Engineering" at the Free University of Amsterdam (abbreviated by VU Amsterdam) has Software Asset Management as one of its main themes. With software assets we mean valuable, recent or already long existing, IT-systems that are the basis for almost all organizations today. We do our research with industrial partners like ABN AMRO, PinkRoccade Getronics and Philips. As COBOL is still the "market leader" when it comes to programming languages we focus on COBOL, for a further motivation we refer to Ralf Lämmel's presentation "Stop bashing COBOL" [.pdf]. This research is currently funded by the CaLCE project. 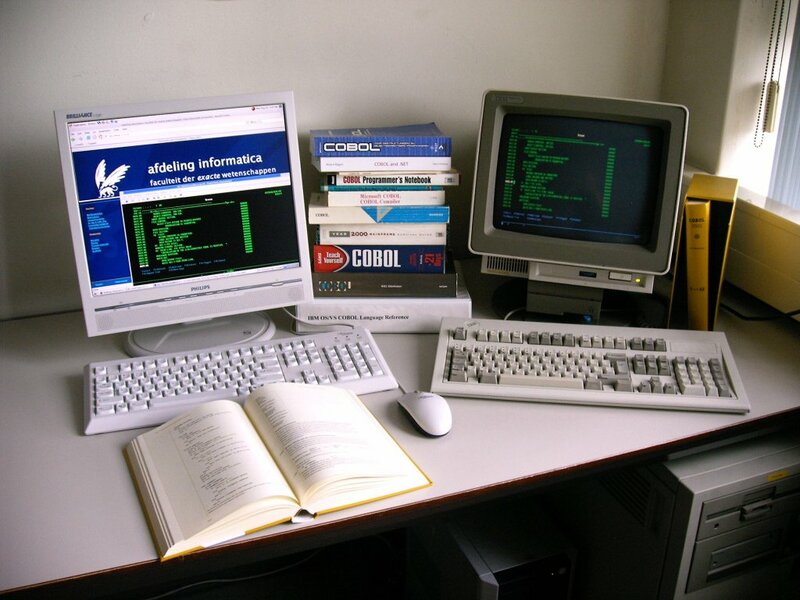 Take a look at our Cobol research laboratory ! Click here for the "Cobol is cool" article in Computable on the Cobol Future 2005 event. SERIOUS, our planned project with Philips, Infosupport and many other European partners. The Dutch funding is currently being evaluated in the SENTER program "Technologische Samenwerking". [.pdf] Ralf Lämmel's presentation "Stop bashing COBOL"
What does aspect-oriented programming mean to COBOL? For more papers see also above mentioned home pages and related web sites. CaLCE -pilot on COBOL Standardization. In this pilot we standardize several of the guidelines that are currently in use within the various teams of a large maintenance shop. These guidelines concern (1) the standardization of the syntax (use of scope terminators, consequent use of terminating period, etc), (2) consistent layout, (3) consistent naming conventions and (4) detection of dangerous control-flow. CaLCE -pilot on system modernization. In this pilot we have investigated how a system can be migrated to a J2EE or .NET platform. Currently the system is implemented on a proprietary legacy platform, it contains a large number of screen definitions which will have to be implemented as web-pages. Also the relational database has to be migrated to a modern equivalent, like Oracle. We hope that our work can help the community of standardization of programming languages to improve the quality of their documents, such that as much as derivates can be generated in an automatic manner. As we are a member of the COBOL Committee (ISO/IEC JTC1/SC22/WG4), we will apply our research to COBOL, but we hope that we can contribute to the commitees of the other programming languages as well. Website maintained by Steven Klusener.